Doctors today assert that they practice "scientific medicine," and patients think the treatments they receive are "scientifically proven." However, this ideal is a clever and profitable marketing ruse, not fact. Doctors today commonly assert that they practice "scientific medicine," and patients think that the medical treatments they receive are "scientifically proven." However, this ideal is a dream, not reality, and a clever and profitable marketing ruse, not fact. • Four percent were likely to be harmful or ineffective. In the late 1970s, the US government conducted a similar evaluation and found a strikingly similar result. They found that only 10 percent to 20 percent of medical treatment had evidence of efficacy (Office of Technology Assessment, 1978). Doctors like to point to the "impressive" efficacy of their treatments in real serious diseases, like cancer, and doctors (and drug companies) are emphatic about asserting that anyone or any company that says (or even suggests) that they have a treatment that might help people with cancer are "quacks." However, do they maintain this same standard when evaluating their own treatments? Even a recent issue of Newsweek highlighted the fact that "We Fought Cancer, and Cancer Won" (Begley, 2010). Despite the truly massive amounts of money that doctors, hospitals and drug companies are effectively extracting from patients, employers, insurance companies and governments, we are certainly not getting our money's worth. Even when there is "proven efficacy of treatment" in studies, the bigger question is how common is this proven efficacy utilized in medical care today? Be prepared to be shocked. "Quackery" is commonly defined as the use of unproven treatments by individuals or companies who claim fantastic results and who charge large sums of money. Although modern physicians may point their collective finger at various "alternative" or "natural" treatment modalities as examples of quackery, it is conventional medical treatments today that are out-of-this-world expensive, and despite real questionable efficacy of their treatments, doctors give patients the guise of "science." I certainly realize that many of us have benefited greatly from modern medicine, but I also realize that many of us have been hurt greatly from it too. The challenge for all of us is to determine how can we make modern medicine more "scientific," more effective and more safe. I have previously made clear that my own point of view on this subject is that we must develop a more "integrative model" of medicine and healing and that we should utilize various naturopathic and homeopathic methods as a way to honor the Hippocratic tradition of "First, do no harm." Sadly, however, it seems that too few doctors understand or respect this Hippocratic dictum. Today in America, every man, woman, and child is prescribed around 13 prescription drugs per year (and this doesn't count the many over-the-counter drugs that doctors prescribe and that patients take on their own) (Kaiser, 2006). Just 12 years earlier, Americans were on average prescribed less than eight drugs per person, a 62 percent increase! The fact of the matter is that drugs are not tested for approval in conjunction with other drugs, and the safety and efficacy of the use of multiple drugs together remains totally unknown. This practice of "polypharmacy" is increasing substantially, and Big Pharma is pushing it hard and benefiting from it in a big big way. According to a 2008 nationwide survey, 29 percent of Americans used at least five prescription medications concurrently (Qato, Alexander, Conti, 2008), while just three years previously, 17 percent took three or more prescription drugs (Medscape, 2005). Even conservative publications such as Scientific American can no longer deny the increasing serious problems from pharmaceuticals. A recent article highlighted the fact that there has been a 65 percent increase in drug overdoses leading to hospitalization or death just in the past seven years (Harmon, 2010). Are Our Children and Elders Safe? Not at all. We all want drugs given to infants to be as safe as possible, but mothers and fathers will be surprised and perhaps shocked to know that very few drugs are ever tested on infants. A 2007 study of over 350,000 children found that a shocking 78.7 percent of children in hospitals are prescribed drugs that the FDA has not even approved for use in children (Shah, Hall, Goodman, et al, 2007). If this isn't shocking enough, a survey in England found that 90 percent of infants were prescribed drugs that were not tested for safety or efficacy in infants (Conroy, McIntyre, Choonara, 1999). There is almost a 350 percent increase in adverse drug reactions in children prescribed an off-label drug than children who were prescribed a drug that had been tested for safety and efficacy (Horen, Montastruc, and Lapeyre-mestre, 2002). Doctors are committing "medical child abuse" on a regular basis (I wrote a more detailed article about this subject, here). An even stronger case can be made for the epidemic of "elder medical abuse" due to the much larger number of drugs prescribed to and for our senior citizens. It is no wonder that so many of them have become mental zombies, while Big Pharma profits big time and insurance companies simply raise their rates. If we were living a lot longer and the quality of our lives was improved by medical care, one could make a case for why today's medical care is providing more benefits than problems, but this is simply not true. Although we are commonly told that we are living longer than ever now, this is simply a clever, even tricky, use of statistics. The fact of the matter is that there has been a considerable reduction in deaths during the first five years of life ... and this reduction in deaths has resulted primarily from a medicinal agent called "soap," not from the use of any specific conventional pharmaceutical agent. Ultimately, an American who was 40 years old in 1900 and an American who was 40 years old in 1960 has a similar chance of living to 80 years old today. Adherents of conventional medicine have consistently asserted that its methods are scientifically verified, and they have ridiculed other methods that are suggested to have therapeutic or curative effects. In fact, conventional physicians have consistently worked to disallow competitors, even viciously attacking those in their own profession who have questioned conventional treatments or provided alternative modalities. More recently, medical organizations simply work with insurance companies to help them determine what should and shouldn't get reimbursed, a clever way to kill competition bloodlessly. And yet, strangely enough, whatever has been in vogue in conventional medicine in one decade has been declared ineffective, dangerous and sometimes barbaric in the ensuing decades. Surprisingly, despite this pattern in history, proponents and defenders of "scientific medicine" tend to have little or no humility, continually asserting that today's cure is truly effective ... and in any case, strongly asserting that any "alternatives" to this ever-changing treatment are quackery, sheer quackery, whether they know anything about these alternative treatment modalities or not. The good news about conventional medicine and one of its remarkable features for which it should be honored is its history of consistently and repeatedly disproving its own treatments. The fact that only a handful of conventional drugs have survived 30 or more years is strong testament to the fact that conventional medicine is honorable enough to acknowledge its mistakes. But then again, because drug patents only last for a certain limited period of time, there are real substantial benefits when drugs have a relatively short lifespan. Big Pharma can charge big money during this time-frame, and then, let go of it when it goes off-patent, at which time a new, high-priced drug is conveniently developed to replace it. Like the fashion industry, medical fashion changes with rapidity, supporting a powerful economic arms race. In 2002, the combined profits ($35.9 billion) of the 10 largest drug companies in the Fortune 500 were more than the combined profits ($33.7 billion) of the remaining 490 companies together (Angell, 2004, 11). The only reason these drug companies did not maintain this shocking financial advantage is that the oil companies' profits have increased considerably with the Iraq War, thus raising the 490 non-drug companies' profits slightly higher. But then again, one would assume that the profits of 490 of the largest companies in the world would be substantially more than just 10 companies in one commercial field. This economic information is important, even essential, because learning how to separate the "science" of medicine from the business of medicine has never been more difficult. The combined efforts of the drug companies and the medical profession, which together may be called the "medical-industrial complex," have been wonderfully effective in convincing consumers worldwide that modern medicine is the most scientific discipline that has ever existed. There is big big money to be made in drug sales, and brilliant marketing has led too many of us to ignore or excuse this bully side of medicine. The New York Times recently uncovered the fact that Pfizer admitted to paying $20 million in the last six months of 2009 alone to 4,500 doctors to "consultation" and to speak on their behalf (and this doesn't include payments to doctors outside of the US) (Duff, 2010). It seems to be time to stop calling them "drug companies" and call them "drug pushers." Yes, a gorilla is in the house, but anyone who refers to him as a gorilla is usually called a quack or a crank. This gorilla was not born yesterday; he has been growing for generations. A part of his self-defense propensities is to eliminate competing forces, whether the other side seeks cooperation or not. Any competitive force is frequently and soundly attacked. The history of homeopathy shows this dark side of medicine. From 1860 to the early 20th century, the AMA had a consultation clause in its code of ethics that members were not allowed to consult with a medical doctor who practiced homeopathy and weren't even allowed to treat a homeopath's patients. At a time in medical history when doctors bloodlet their patients to death and regularly prescribed mercury and various caustic agents to sick people, the only action that the AMA considered reprehensible and actionable was the "crime" of consulting with a homeopath. 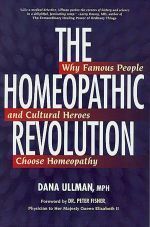 In fact, the entire Medical Society of New York was kicked out of the AMA in 1881 simply because this state's medical organization admitted into its membership any medical doctors who utilized homeopathic medicines, no matter what their academic credentials were. They only rejoined the AMA 25 years later (Walsh, 1907, 207). This King Kong, however, is not a monster to everyone. In fact, this big gorilla is wonderfully generous to executives, to large sales and marketing forces, to supportive politicians and to the media from whom he buys substantial amounts of advertising (and thus, an incredible amount of positive media coverage). And this gorilla is wonderfully generous to stockholders. While it may seem inappropriate to criticize profits, it is important and appropriate to do so when profits are unbelievably excessive, when long-term efficacy hasn't stood the test of time, and when common use of more than one drug at a time is rarely if ever scientifically tested for efficacy. Although these observations just mentioned may seem harsh and offensive to some people, they are made with the concurrent acknowledgment that most of us know someone whose life was saved or at least whose health was significantly restored by conventional medical treatments. I myself am the son of a fabulous father who was a physician and insulin-dependent diabetic. In other words, I would not be alive today if it were not for some important conventional medical discoveries such as insulin. We should not "throw the baby out with the bathwater," nor do we want to ignore the bathwater in which we place our babies. Most of us also know someone whose health has been seriously hurt, or whose life was cut short, by modern medical treatments. Drug companies defend their large profits by asserting that they spend tremendous amounts of money on research and development, but they tend to hide the fact that they spend approximately three times more money on marketing and administration. And the obscenely high profits of the drug companies take into account all known expenses. Ultimately, drug companies are wonderfully creative in convincing us all that their drug treatments are "scientific," and too many of us actually believe them. Angell, M. The Truth about Drug Companies. New York: Random House, 2004. This fact is extremely startling, but the source is reputable: Marcia Angell, MD, is former editor of the New England Journal of Medicine. Consumer Reports, "High Anxiety." January 1993, 19-24. Darwin, F. (ed.). The Life and Letters of Charles Darwin. New York, D. Appleton & Co., 1903. Horen B, Montastruc JL, and Lapeyre-mestre M. "Adverse drug reactions and off-label drug use in paediatric outpatients." Br J Clin Pharmacol. 54(6); Dec 2002, 665-670. doi: 10.1046/j.1365-2125.2002.t01-3-01689.x. "Levi, R. Science Is for Sale," Skeptical Inquirer, July/August 2006, 30:4, 44-46. Medscape, More Americans Take Prescription Medication. May 3, 2005. "Roberts, W. H. Orthodoxy vs. homeopathy: Ironic developments following the Flexner Report at the Ohio State University," Bulletin on the History of Medicine, Spring 1986, 60:1, 73-87. Shah SS, Hall M, Goodman DM, et al. "Off-label Drug Use in Hospitalized Children." Arch Pediatr Adolesc Med. 2007;161(3):282-290. Walsh, J. J. History of the Medical Society of the State of New York. New York: Medical Society of the State of New York, 1907.